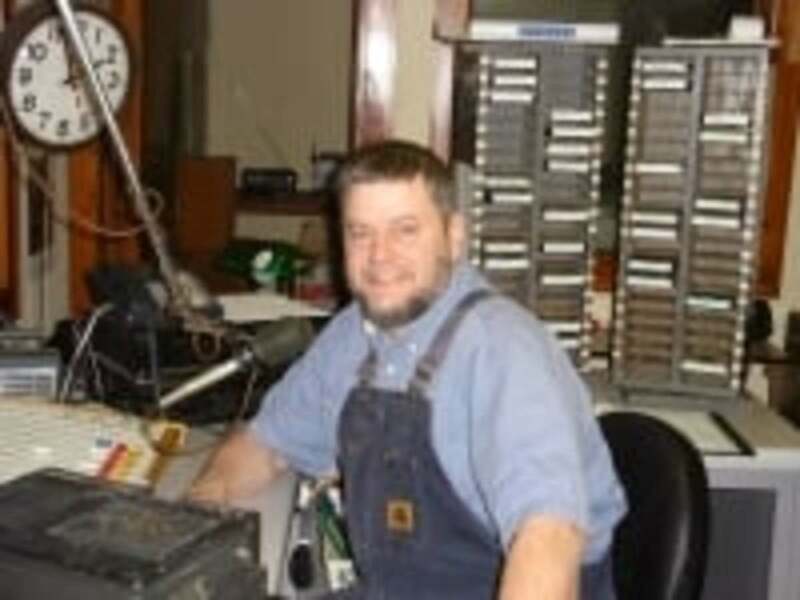 The careful use of JFET devices in regenerative radio design can bring many benefits. JFET’s have much lower noise than BJT transistors and their high input impedance allows them to be directly connected to a resonant LC circuit without the impedance matching that BJT’s require. Historically JFET devices have had lower transconductance gain than BJT’s. However many modern devices such as the 2SK222, BF862 , 2SK170 and IF9030 have very good gain characteristics and exceptionally low noise figures. Besides noise and gain there are 2 other figures of merit you need to look at. The first is the IDSS. This is the amount of current that will flow through the JFET when there is zero bias voltage at the gate of the JFET. The value should be high enough that the JFET has good gain characteristics without having excessive thermal dissipation. Any value between 2mA and 20mA is usually ok. The second important figure of merit is the input capacitance Ciss. A high input capacitance will add extra capacitance to the LC resonant circuit. More importantly it will increase the amount of frequency drift with temperature change. For low frequency reception a high input capacitance is not a big problem, for higher frequency work you might consider using a JFET with a low input capacitance. Additionally if frequency drift is still a problem you can connect the LC resonant circuit to the JFET gate via a tap halfway down the inductor to reduce the frequency drift by 4, or 2/3 of the way down to reduce the frequency drift by 9. A JFET based regenerative receiver using an AC-linked differential pair. A simple but effective regenerative radio circuit is shown in Figure 1. The 2 JFET devices are arranged as an AC-linked differential pair. This is important because the gain of a differential pair decreases with increasing input level. If this gain requirement is not met then the regenerative receiver will pop into oscillation as the amount of regeneration is increased and not stop oscillating until the regeneration control is turned far back. L1 is the regenerative tickler coil which supplies positive feedback to the LC resonant circuit C2 and L3. If L1 is connected the wrong way around it will incorrectly supply negative feedback instead. You will need to create a mechanical positioning system to move L1 close to L3 to control the amount of regeneration. The exact number of turns required for L1 is best determined by experiment. L2 is a 220uH radio frequency choke (RFC), for reception frequencies lower than 5MHz it's value should be increased to a few mH or 1k resistor should be placed in parallel with it to reduce any possible effects of self-resonance. 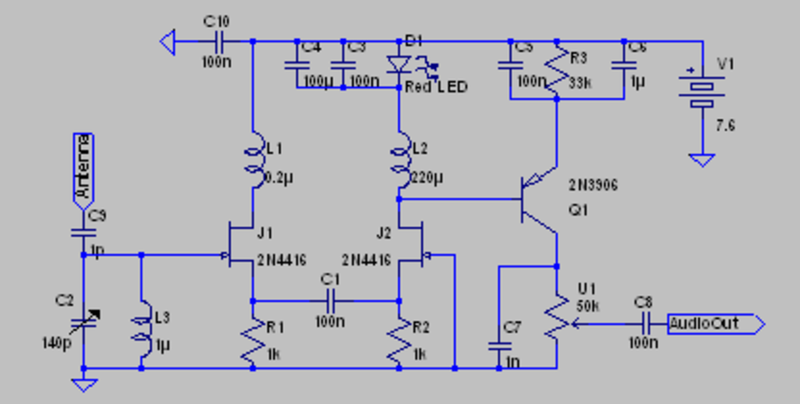 Ideally L2 should be self-shielded to reduce the chances of AC hum pickup. Q1 forms a very sensitive transistor square law AM detector. JFET regenerative receiver with tuned circuit differential pair. Figure 2 shows a very similar circuit however here R1, R2 and C1 have been replaced by a resonant LC circuit C1 and L4. Ideally the variable capacitors C1 and C2 should be ganged together. Because of the low impedance environment the resonant circuit C1 and L4 is very broadly tuned and does not require exact alignment with resonant frequency of C2 and L3. However inclusion of a trimmer capacitor in parallel with C1 might be a good idea. The circuit in figure 2 has slightly higher gain than the circuit in figure 1 and may have some advantages with higher input capacitance JFET’s. If you use JFET’s intended for VHF or UHF work you may need to include stopper resistors or ferrite beads in the gate and drain of J1 to prevent parasitic oscillations. It is usually easy to detect parasitic oscillations because the brightness of the red LED D1 will change as you move your fingers near the circuit. A JFET-BJT regenerative receiver with voltage controlled regeneration. Figure 3 shows a mixed JFET - BJT regenerative circuit. The amount of regeneration is controlled by adjusting the potentiometers R3 and R6. Increasing the voltage at the base of Q2 steers signal current from the source of J1 to the regenerative feedback coil L2. 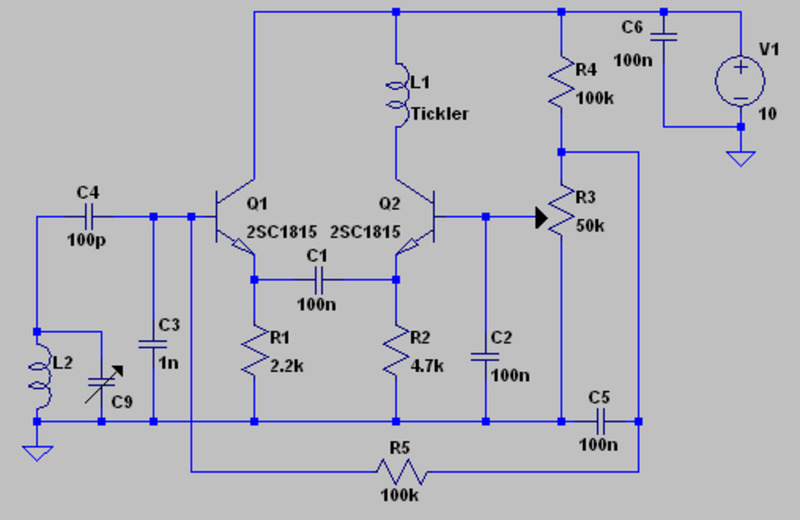 JFET's allow you to create very high sensitivity regenerative radios. The low phase noise of the resulting circuits also gives you extremely high selectivity. When used with a good voltage regulator the resulting circuit has high frequency stability. One possible way to improve frequency stability further would be to create a small temperature control circuit to hold the JFET's at constant temperature. You can easily experiment with different JFET's to see which give the best trade-off between low noise, selectivity and frequency drift. Generally the frequency drift is very low anyway once the circuit has warmed up for a few minutes. There are some great modern JFET devices currently available and a JFET regenerative receiver is unique way to explore their characteristics. 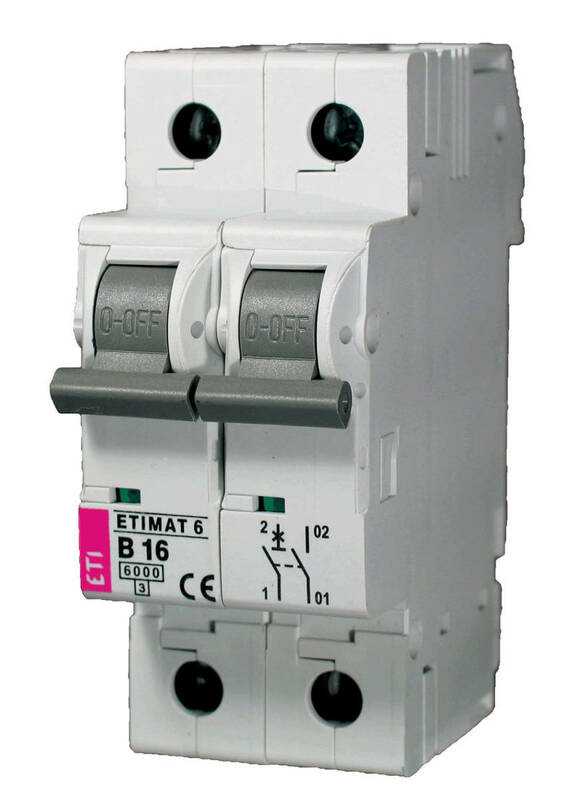 Difference between fuses and circuit breakers. I have home built your jfet-regen, but added a grounded gate jfet rf preamp in the front end for better antenna isolation, and a voltage regulator. Added also a "throttle capacitor" for a fine adjustment of positive feedback. The radio is very sensitive, selective, frequency stable, the regeneration is smooth and has an amazing low background noise. The absolute best regen i have ever built- thanks mr. Hoa Xuan Nguyen! "This low impedance greatly increases the gain of J1. Now the low impedance at the source of J2 is not exactly constant either. " Thanks for the detailed explanation. I get it now. At some point I will run this through a circuit simulator to more fully see what's going on, but your "changing impedance seen by J1's source" explanation makes sense for now. It's an interesting approach. You cannot consider J1 in isolation. Without J2 the gain of J1 would be very limited by the presence of the source resistance R1 (1k). The source of J2 is a low impedance point (a few ohms) which is connected by C1 to the source of J1. It takes a lot of current through C1 to vary the voltage at the source of J2 even slightly. This low impedance greatly increases the gain of J1. Now the low impedance at the source of J2 is not exactly constant either. It depends on the current flowing through C1. When the current causes the voltage at R2 and the source of J2 to be more positive than average the impedance increases. Contrariwise a lower than average voltage at R2 and the source of J2 decreases the impedance. This is how the compressive gain situation comes about. Your best bet for understanding the circuit is to understand J1 and J2 as forming a differential pair (long tail pair), that just happen to be linked by the capacitor C1 (rather than a wire link), and then doing your research into the differential pair topology. The circuits are simple to understand once you understand exactly that they are based on differential pairs. 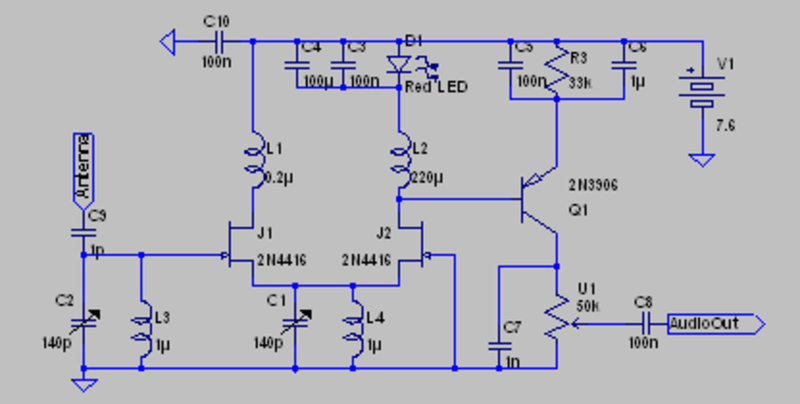 I'm not sure I understand the dynamic behavior of this circuit (figure 1) correctly. Therefore I will use a qualitative analysis, which may be incorrect. Please correct me if I am wrong. First, in figure 1, consider the J1 oscillator in isolation. J1 will oscillate without J2 or Q1. Correct? Then J1 will act like a single-JFET Armstrong regenerative amplifier. Next, add J2 into the circuit. J2's input (taken off of the J1 source and going into the J2 source) is amplified by J2 and ends up at the J2 drain, which only goes further downstream (into detector Q1) and not back as part of the J1 feedback loop. Therefore, even if J1 and J2 form a differential amplifier (source-coupled pair) with gain compression behavior, it seems that the gain-compressed output of the differential pair cannot affect the regenerative amplification since the regenerative feedback loop takes its feedback not from the output of the differential pair at J2's output, but instead only from half of the differential pair at J1's output. In other words: how does the mere existence of J2 (which is only connected to J1's output at the source, not its input at the gate) affect the gain compression behavior of the regenerative feedback loop, which is self-contained within J1 (going from the J1 drain output back to the J1 gate input)? Other differential pair regenerative receivers or oscillators that I've seen always take the feedback from the second device in the pair (the one with the grounded-gate/grounded-base) and feed it back to the gate/base of the first device in the pair. This is different than your figure 1, where no energy from J2 seems able to get back to J1. However, I note that your figure 3 appears to use the more traditional two-device feedback arrangement, as Q2's output goes back to J2's input. It is there as part of a differential pair circuit. This has the effect of making the gain of J1 compressive as is required for smooth control of the regenerative effect. Obviously it also provides isolation of the AM detector circuit from the Armstrong loop as well. If you look up "tanh" and "differential pair" on the Internet you will find information about the transconductance gain (change in output current for a given change in input voltage) of various active device pairs in the differential arrangement. In Figures 1 and 2 it appears that the 2nd JFET J2 is not part of the feedback loop. J1 by itself contains a complete Armstrong feedback loop. Is this intended? If so, what is the function of J2?